“A Religion of One’s Own: A Guide to Creating a Personal Spirituality in a Secular World” by Thomas Moore. Gotham Books. (New York, 2014). 283 pp., $27.50. “Perennial Wisdom for the Spiritually Independent: Sacred Teachings — Annotated and Explained” annotated by Rami Shapiro. SkyLight Paths Publishing (Woodstock, Vt., 2013). 313 pp., $16.99. If your New Year’s resolution is to grow spiritually, this pair of books will help you get off to a good start. In “A Religion of One’s Own,” Thomas Moore builds upon themes he earlier explored in his best-selling “Care of the Soul.” These include creating a personal spirituality in everyday life that draws wisdom from the experiences of mystics, artists, musicians, philosophers, writers, and others who have shaped their own spiritual paths in the midst of a secular, materialistic world. You need not be a formal member of a religious institution to achieve spiritual growth and even transcendence, Moore argues. He points to Henry David Thoreau, Simone Weil, Georgia O’Keeffe and many other seekers who fashioned their own heartfelt spirituality outside of organized religion. Moore discusses their ideas and practices in detail, alongside others’ and also his own. Strongly influenced by his Catholic upbringing, Moore spent a dozen years living as a contemplative monk before marriage and parenthood. It’s clear that all of these experiences enrich his perspective, which emphasizes the intersection of religion and psychology. Accordingly, he encourages readers to take note of their dreams and intuitions as they strive to create a personal spirituality and live more purposefully. Moore’s catholicity and depth shine on every page, as he draws from disparate sources that include Emily Dickinson, Carl Jung and Trappist Father Thomas Merton — as well as Socrates, Buddha and St. Hildegard of Bingen. However, this is no pastiche but an original and insightful exploration of what gives our lives meaning. Moore’s tone is learned yet conversational; reading his book is like sitting down with a trusted spiritual adviser who gently guides you to a place of special vision. In this land, Moore helps us see clearly many things, among them: that we are free to learn from the world’s different religious traditions and practice; that the everyday secular world is often full of the sacred, if we only open our eyes; that we must regularly have mystical experiences (think art and nature) to be fully human; and that we should make use of the arts as a means to spiritual insights. For example, visual “art presents primary insights into emotions and idea that run so deep as to have a numinous and spiritual quality,” Moore writes. Consider O’Keeffe; while “her paintings depict objects commonly found on the land around her home,” they reveal considerably more than the physical world. “Alive” and “penetrating,” her work demonstrates that “she looked closely at the land around her and found divinity.” Thus, Moore explains, art and religion often move in parallel, supporting each other. Whether you embrace organized religion, “A Religion of One’s Own” will inspire. It is complemented by “Perennial Wisdom for the Spiritually Independent,” a compendium of sacred texts and teachings from Christianity, Judaism, Islam, Hinduism, Buddhism and other world religions. The book is organized according to several age-old questions found at the heart of every religion: Who am I? Where did I come from? Where am I going? How shall I live? Why? Rami Shapiro’s annotations are original and helpful. For instance, in discussing a seemingly contradictory passage from “Chuang-Tzu: The Tao of Perfect Happiness,” he notes “the double bind of spiritual practice: You are trying to become that which you already are and, in so doing, pit one sense of self against another, albeit a higher or holier sense of self. While Catholics will recognize many of the sacred texts and teachings from the Old and New Testaments, at least as many originate from less well-known sources, such as the Bhagavad Gita (Hindu), the Hadith (Islam), and the Heart Sutra (Buddhism). Shapiro adroitly navigates the collected wisdom of these various religious traditions to present an integrated whole that emphasizes their common vision. He offers practical suggestions of how readers can use this wisdom in their everyday lives. The author’s own tradition is Jewish and he has practiced his spiritual mentor Eknath Eswaran’s “passage meditation” for decades. Here he presents a basic guide to this method of focusing intently on a text to incorporate its guidance into one’s daily life. The result is engaging and inspiring. 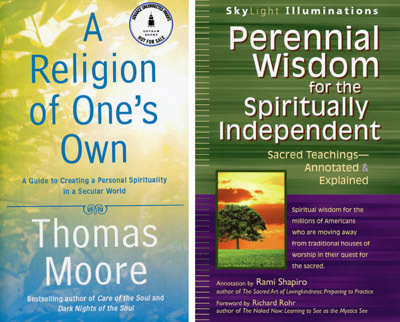 “Perennial Wisdom for the Spiritually Independent” is a kind of day book for those seeking to create a richer spiritual life. It lends itself to being read in small bits like a daily meditation, but it can also be consumed more wholly. A bonus is the two appendices, one offering brief, analytical biographies of “sages cited” from Maimonides to St. Catherine of Genoa and the other, annotations of primary sources such as the Katha Upanishad and the Talmud. These last 25 pages, prepared by the author’s son Aaron Shapiro, testify to the breadth and depth of scholarship that inform this book. Roberts, the author of “Dorothy Day and the Catholic Worker,” directs the journalism program at the University at Albany, State University of New York.